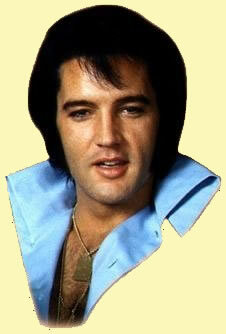 : I had heard about him when I was a child just through television and such.Everyone knows who *Elvis* is! : When i was 9 years old we went to Las Vegas and I saw a legends in concert show and the Elvis inpersonator came down and gave me a kiss on the cheek and from then i was hooked .I kept every cutout,scrap,cassett tape,and any little thing I could that had anything to do with Elvis.I was always made fun of for being an Elvis fan as a kid but I didn;t care!I just thought the entire world of him then and I still do AT 22 years old. Infact my familt has a tribute to Elvis show that we have been doing for about 7 years all along the gulf coast!!! "My Message to Elvis": I am so sorry that you couldn't live a normal life because of your fame.Im sorry that your job as an entertainer was so demanding that it was all you could do but help your self with pills to stay awake or fall asleep,because it meant so much to you to please your fans.you should know how wonderful you are and how sweet and giving and tenderhearted you are!i love that you always no matter what kept your "odd" style ,even when people would make fun of you for it. i love you as an entertainer,as a person,and as an idol!i love you very much. : my favorite song is "if i can drream" and my favorite movie is "jail house rock"
5. Which is your favourite SUIT that Elvis wore on stage? : the aloha 6. Who do you think Elvis loved most in his life, his greatest love? : because there will never be anyone like him ever again.there will never be another entertainer that will touch souch a wide spread group of people as him.he was so loveable! : Yes i have been and from what i remember it was great.i was a little disapointed in the fact that i felt like i was being rushed by the people behind me ,but i am going in april and i WILL NOT BE RUSHED! Thank you for your comments on our survey. Elvis was truly an amazing person. I think once Elvis has touched your heart, that`s were he stays no matter what. Thank you for sharing your Graceland experience with us, I`m sure your next visit will be to your total satisfaction. Not that I have been yet. It must be wonderful being involved in the tribute to Elvis show, you and your family are out there honoring our King, I would like to say `THANK YOU ALL,` that is true dedication. We would love to hear more about your tribute to Elvis show. Presley was born poor in Tupelo, Mississippi, the son of Vernon Elvis Presley and Gladys Love Smith Presley. He was raised both in Tupelo and later in Memphis, Tennessee, where his family moved when he was 13. He had a twin brother (Jesse Garon Presley) who died at birth. The young Elvis took up guitar at 11 and, after high school, worked at Precision Tool Company and then drove a truck for the Crown Electric Company. Scottish author Allan Morrison claims that Elvis was of Scottish descent. In an as-yet-unpublished book, Morrison claims to have found that his ancestors lived in Lonmay, Aberdeenshire in the 1700s. According to Morrison, records show that Andrew Presley married Elspeth Leg in Lonmay in 1713. Their son, also called Andrew, went to the English colonies in 1745. Through his father's mother Minnie Mae, Elvis descended from King Henry II of England. His maternal grandmother was Jewish. Each of us stands on the shoulders of our ancestors. So too Elvis; his genealogy provides a fascinating view of the influences that help form him. Our story begins with Elvis's maternal heritage through his mother, Gladys. Elvis's great-great-great-grandmother, Morning White Dove (1800-1835), was a full-blooded Cherokee Indian. She married William Mansell, a settler in western Tennessee, in 1818. William's father, Richard Mansell, had been a soldier in the Revolutionary War. Mansell is a French name--its literal translation is the man from Le Mans. The Mansells migrated from Norman France to Scotland, and then later to Ireland. In the 18th century the family came to the American Colonies. The appellation "white" in Morning Dove's name refers to her status as a friendly Indian. Early American settlers called peaceable Indians "white," while "red" was the designation for warring Indians or those who sided with the British in the Revolutionary War. It was common for male settlers in the West to marry "white" Indians as there was a scarcity of females on the American frontier. Like many young men in the American Southwest, William Mansell fought with Andrew Jackson in the Indian Wars of the early nineteenth century. He fought with Old Hickory in Alabama, at the Battle of Horseshoe Bend, and later in Florida too. Returning to Tennessee from the Indian Wars, William Mansell married Morning White Dove. Elaine Dundy says of the marriage, he (William Mansell) gained "age-old Indian knowledge of the American terrain; of forests and parries; of crops and game; of protection against the climate; of medicine lore, healing plants as well as something in which the Indians were expert--the setting of broken bones." Moreover, added to Elvis's lineage were Morning White Dove's ruddy Indian complexion and fine line of cheek. Like many other settlers, the newlyweds migrated to Alabama from Tennessee to claim lands garnered in the Indian Wars. The Mansells settled in Marion County in northeast Alabama near the Mississippi border. The Scots-Irish, like William Mansell, were the predominant settlers of Alabama. One-tenth of the population in colonial America was Scots-Irish at the time of the American Revolution. And a very interesting group they were. The Anglican Reverend Woodmason had this to say about the Scots-Irish women of William Mansell's day. "They wore nothing but thin shifts and a thin petticoat underneath. They are sensual and promiscuous. They draw their shift as tight as possible to the body, and pin it close, to show the roundness of their breasts, and slender waists (for they are generally fined shaped) and draw their petticoat close to their hips to show the fineness of their limbs--so that they might as well be in puri naturalibus." The Scots-Irish in America were a passionate community living close to the earth. They disdained the niceties of their British neighbors. Of this Reverend Woodmason had to say," they delight in their present low, lazy, sluttish, heathenish, hellish life, and seem not desirous of changing it. These people despise knowledge, and instead of honoring a learned person...they despise and ill-treat them..."
There were other views on the passionate lifestyle of the Scots-Irish, however. James Hall of Philadelphia described a young, Scots-Irish frontiersman in this way. "He strode among us with the step of Achilles...I thought I could see in that man, one of the progenitors of an unconquerable race; his face presented the traces of a spirit quick to resent--he had the will to dare, and the power to execute, there was something in his look which bespoke a disdain of control, and an absence of constraint in all his movements indicating an habitual independence of thought and action." Think of Elvis in these words: the will to dare and the power to execute, a disdain of control in all his movements indicating a habitual independence of thought and action. This is the Scots-Irish heritage from which Elvis Presley issued. In his genes he carried an independence of blood, the will to dare and the power to execute. Many influences formed Elvis Presley besides the genealogical, yet this description has a haunting accuracy. Description of site contents: This site contains Elvis Presley biography information, history on Elvis Presley life story, Elvis Presley pictures and photos, Elvis Presley song lyrics, Elvis Presley movie resources, free e-books and articles listed for your convenient search in subjects of: Elvis Presley pictures and photos, Elvis Presley song lyrics, Elvis Presley movie resources, Elvis Presley childhood, Elvis Presley biography Band members biography, Elvis Presley girlfriends, Elvis Presley spiritual medium stories, Elvis Presley biography Memphis mafia stories, Elvis Presley diary quotes, Elvis Presley biography movie and music details in relation to the Elvis Presley autobiography and interviews of friends and family members for the Elvis Presley biography website written by a fan for his fans.